After a year where you had The Witcher 3, Metal Gear Solid V and Pillars of Eternity, the wise thing to do is to lower your expectation for the next year. Sadly, time proves this to be a good advice. In 2016, most notable titles falls into two categories: some are the kinds that I can never get interested in; while some are the type that had accumulated a mountain of hype in me but ended up really flat or even worse. But still, if you have managed to waste sufficient time in front of screen, like me, it’s not impossible to have some great experience. On a hindsight I should have avoided some of the games I actually bought and turn to one of above. But what’s done is done, let’s start the count down. 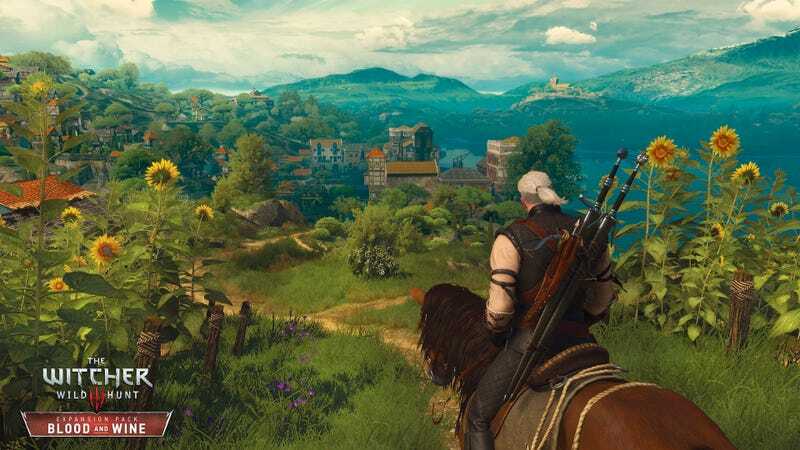 The Witcher 3 has turned from a shock into a normal state. I am used to lost myself in the huge and gorgeous world, meet weird people and trouble and bet with myself which choice has the worst outcome. While Blood and Wine has no shortage of these, it has some relatively more normal things, which looks strange in The Witcher 3. Do you mind your last moments with Geralt has a manageable garden, a happy ending and a land blessed by sunshine and wine? I think there are better choices but it doesn’t matter. What matters is here is another tens of hours of witcher style adventure to experience. I will forget every detail of its plot in the coming years, but I will its thorough honesty. It builds up a rule set and follow it relentlessly. Refusing to gloss over anything, it sacrifices any character that stands in its way when majority of writers will tell you “finally our hero overcome all the difficulty with his friends”. It just wants to let the machine run and see the outcome. More impressively, in the end it still wrapped up the whole story in a conclusive tone. None of this is done perfectly of course, but it really pulls me into thinking the same thing that the game is talking about that I didn’t really care those flaws. Deus Ex: Mankind Divided has plenty of reasons to show up in someone’s top disappointment list. It has a poorly presented main story, unimpressive control and visual and irritating real money purchases. What saved the game is that it established a winning formula years ago and managed to follow that quite faithfully. (Unfortunately, another RPG published by Square Enix wasn’t so lucky...) Traversing the complicated districts with your own way, exploring all the rooms and email boxes you are not supposed to touch and rewarded by mini story, all the activities I enjoy so much in Human Revolution are back in a good shape. I still cannot resist my attempt to travel into every vent as if there are gold on the other side. Also several side quests featuring mystery and urban legends are superbly written and executed, adding a sense of dark fantasy to the set-up which outshines the “apartheid” things the developer wanted to address. In the competition of “sticking to the old formula and improve safely”, XCOM2 wins. Instead of getting stale or mindlessly inflating things, this game plans carefully with a clear goal in its mind, coordinating every element to work towards it. The result is a fluent experience totally isolated from grinding and routine. Every choice made on the map, in the armory and at the emergency call shapes your experience in the next. Comparing to previous title, I like the situation now where you are actively expanding and making choice. The same is true for tactical combat, which is more dynamic and intensive, with plenty of options to actively engage and rain overwhelming firepower on enemy. Yet with all these craziness, it still put the development of campaign under control, giving you sufficient space to experiment and improve. I never expected I would enjoy Dishonored 2 so much, not to mention expected to be the savior of 2016. It is basically what I wished Deus Ex: Mankind Divided to be. Farewell to the first game which put you in a garbage can from beginning to the end, this game embraces you with tendering light and vivid color. Every map is a storyteller themselves. They speak fluently with color and style. They carve the character, emotion and conflict into every place you look at, be it the furthest mountain or a random guy’s desk. They bury all the path flawlessly into the surrounding, silently guide you to the secret. This game always rewards the one who has the maximum curiosity rather than those follow the marks in the UI. In a year full of flatness and disappointment, it’s luck we still have Dishonored 2 injecting the most excitement and surprise.